CAUTION: Blow sidewalks & driveways with leaf blower or sweep before watering to prevent rust spots! Apply in early September. 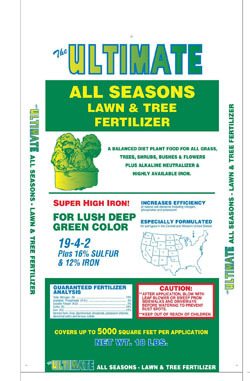 "Ultimate All Seasons Lawn & Tree Fertilizer" may be applied at anytime to your lawn, trees, shrubs, bushes and flower beds. All applications on all grasses should be at a rate of 18 lbs. on up to 5,000 sq. ft., except buffalograss, which can be 18 lbs. on up to 6,000 sq. ft. If you do not use a 4-step program and want only plant food without herbicides, this product should be applied in April, June, early September and early November on cool season grasses. 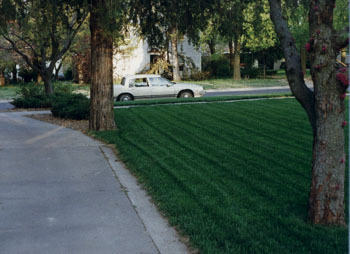 The best times to apply on warm season grasses are mid-May, early July and early August. Follow instructions on the bag!